Sumiko Iwamuro knows a thing or two about juggling work. She spends her days behind the counter at a family-run specialty gyoza restaurant and one or two nights a month moonlighting under her stage name DJ Sumirock. It is an impressive feat for someone 82 years old, although she insists otherwise. 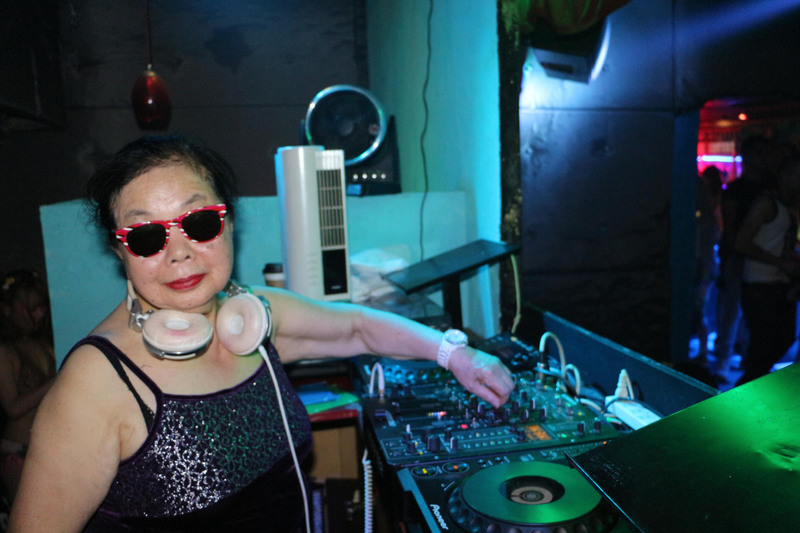 At 2 a.m. when other octogenarians are fast asleep, Iwamuro — donning her trademark sunglasses and bright red lipstick — is spinning beats to the delight of the crowd at a dance club in Kabukicho, the famous red-light area in Tokyo’s Shinjuku district. 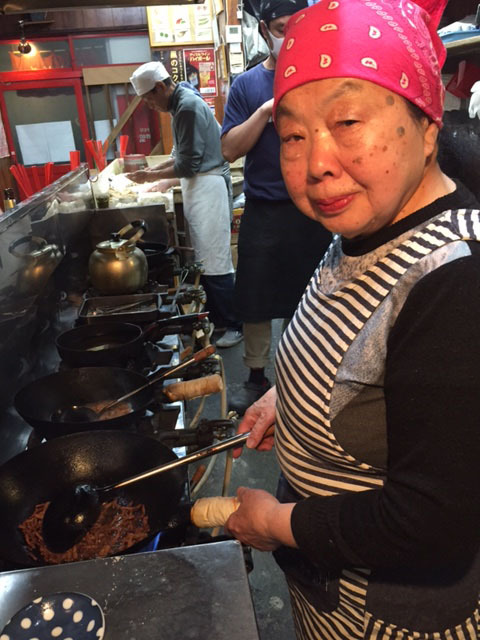 She has been cooking gyoza dumplings since she was 19 at the restaurant her father started more than six decades ago. Iwamuro manages to make several different dishes all at once, handling huge pots and frying pans on a big stove while memorizing the orders. She says the multitasking of cooking is a lot like spinning vinyl and just as enjoyable. 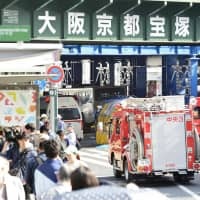 “While keeping an eye on the fire, I’m also thinking in what order I should serve food to customers,” she said, adding that deejaying also requires quick arrangements and spontaneity, but what is most similar is that the result counts most of all. 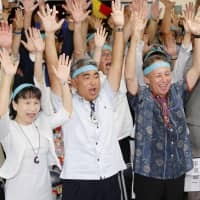 Iwamuro first started deejaying when she was in her late 70s, after her husband passed away. A French friend, who is now the owner of the venue where she performs, introduced her to club music. 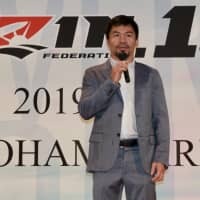 To do it right, Iwamuro spent a year in training at a local DJ school. As she puts it, she didn’t want to just be “a performing monkey.” She is now so good that she is frequently invited to events in Japan and has even spun in France. “I would say she is very greedy and has to try everything, but that is also what keeps her energy so high,” he said. A slightly tainted black-and-white family photo hanging on the wall in the gyoza restaurant shows Iwamuro as a little girl grinning shyly at the camera. The photo was taken at the start of World War II. Looking at her now, it might be hard to imagine the hardships she has gone through. Still, Iwamuro’s passion for music never faded and the little girl continued listening to jazz through a gramophone, using blankets to muffle the sound. The family’s house was eventually burned down as the war intensified, forcing them to temporarily evacuate. After the war ended, Iwamuro’s father started the dumpling restaurant and never returned to his music career. 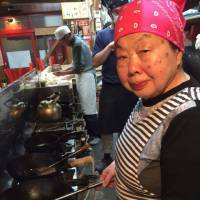 The restaurant’s background music is jazz, which may seem incongruous to some customers, but makes sense to those aware of Iwamuro’s family history. Iwamuro said she often reminisces about time spent with family, recalling memories that have kept her strong and helped her through life. 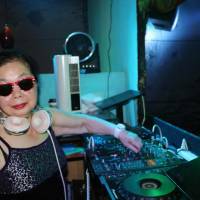 Iwamuro usually takes the stage with the theme from the iconic anime series “Astro Boy,” known in Japan as “Tetsuwan Atomu,” a selection that sets her apart from her fellow DJs, many of whom are more than 50 years her junior. Tetsuwan Atomu, a heroic humanoid robot, made his comic-book debut in 1951, when the scars of the war were fresh and Japan was still under the Occupation. Iwamuro said she chose it as her theme song because the robot was built in the Takadanobaba area where she lives and works. Once the club heats up, DJ Sumirock puts on a performance worthy of her rival DJs with the hottest selection of techno music. “It’s surprising that she’s 82, but what is more important is that she can make you dance!” a 27-year-old man from France said. DJ em, 30, who performed on the same stage, said she hopes to still be spinning at Iwamuro’s age. “I have learned from DJ Sumirock that you can reset your life any time and that it’s never too late to do anything,” DJ em said. She hopes one day to perform in New York and is also thinking about returning to horse riding and taking up the cello.